On February 26th, we invited friends to celebrate Haiti’s unique beauty and culture at Haiti Optimiste, held annually at the French Institute Alliance Française (FIAF) in NYC! 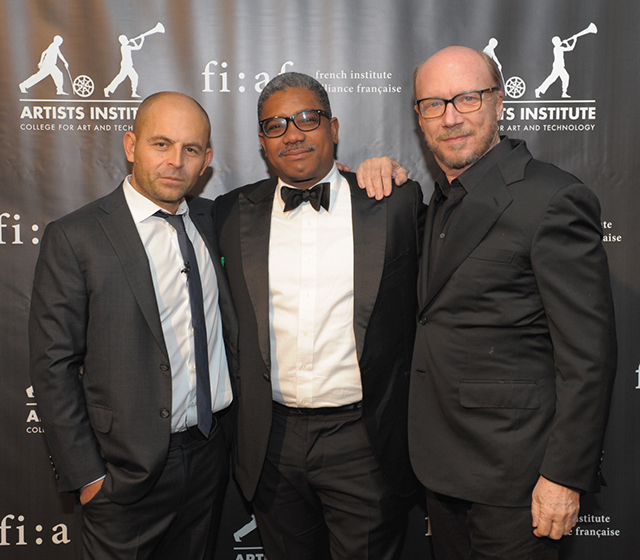 Hosted by David Belle, Paul Haggis, and Marc Baptiste, the event opened with a fantastic performance by Paul Beaubrun. Paul played his hit single “Ayizan,” off the new album Vilnerab. The evening featured a screening of the best works from Artists Institute in the past year. After the screening, the hosts and three brilliant graduates of the Institute, Keziah Jean, Marc Henry Valmond, and Macdala Prévot, took the stage for a Q&A about the trials and tribulations they faced while chasing their dreams. There were many tears as they shared the inspiring successes they’ve accomplished since graduating from Artists Institute. We closed the night with a charity bid which helped us reach $100,000 raised for the evening, then celebrated the night’s success with a reception featuring delicious Haitian delicacies and lively drum music. Thanks to everyone who came out to Haiti Optimiste NYC to support our Artists Institute by sharing an evening of joy and laughter. We’re taking this event on the road — see you in Montreal or Los Angeles next!